Patio doors serve as a focal point of your home’s interior aesthetics. More importantly, they create an impressive connection between your indoors and outdoors. However, there are more to them than just that. Renewal by Andersen® of St. Louis, your local experts in windows and doors, shares four surprising things your patio doors can provide your home. When you install either a sliding patio door or French doors in your home, you allow the interior to have a backdrop of your outdoors. The large glass panes of both these doors are enough to showcase the wonderful scenery, may it be a distant landscape or just your beautiful patio, deck or garden. Patio doors are large enough to occupy most of your wall area. Plus, the intricate designs can accentuate the look of your indoors. This is most especially true for hinged French doors, which boast a traditional design that fits old and historic homes. Opening up your patio doors allows for ventilation that will ensure comfort while you are indoors. Closing them gives you a tight seal, thanks to their interlocking system that ensures not just security, but also protection from the elements. You can also count on patio doors to deliver in terms of energy efficiency. Apart from the views that you see from the inside, your patio doors also help with daylighting in your room. Sliding patio doors, for instance, have expansive glass areas to light up your room naturally. This limits your need to use electricity, which contributes to energy savings. Daylighting also helps your room look more spacious and improves your mood and productivity. 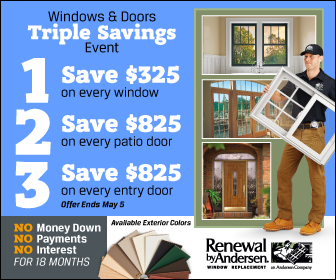 If you want to install patio doors, turn to Renewal by Andersen of St. Louis. Our professionals will guide you in finding the best one that fits the style of your home. Call us today at (314) 332-2364 for more information. You may also fill out our contact form. We serve St. Louis, MO, and other surrounding areas.